Rebecca Glenn is looking forward to the challenge of contributing to the publishing process at Superstition Review. Her experiences in upper-division class work have inspired and encouraged her to consider a career in publishing. She is thrilled to have an opportunity to experience the field first-hand through Superstition Review. 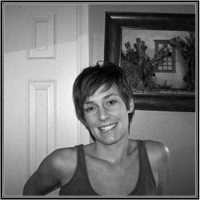 Rebecca Glenn: I am an Art Editor and I am responsible for soliciting art submissions from local and national artists. I also make decisions on art to include in the issue and then I correspond with artists to facilitate its publication. RG: I took a class on publishing in literary magazines with Trish Murphy and my interests stemmed from that experience. I have always been drawn to the publishing process, but it wasn’t until I took the class that I was educated on what exactly literary magazines are. RG: I’m a homebody with a traveling streak. I love to cook and goof around with my two girls. We do a lot of drawing, art projects and impromptu dance parties. RG: Nonfiction is my passion. It would be exciting to be the nonfiction editor. I also really like the idea of being a reader. RG: Madelene L’Engle’s A Wrinkle in Time is a personal favorite. There are certain creations, like A Wrinkle in Time, that are beyond category and that is part of the appeal to me. Most would say it is a children’s novel and yet I read it again a couple weeks ago and was entranced. RG: I like to spend summers re-reading books from my childhood. I was addicted to reading in my youth and my summer days were almost always monopolized by a book and a cool spot in the shade. Since we are just coming out of the summer months now, I most recently finished the Lord of the Rings trilogy. RG: I paint sporadically and also dabble in charcoal. I am constantly drawing. I just finished a charcoal portrait of my mother for her 50th birthday. It is such a momentous celebration and I spent a lot of time trying to capture the years of her life in a single expression; it was tough. As far as writing goes, most of it is academic these days due to my school schedule. SR: Where do you see yourself in 10years? RG: That is the big question…I’m not so concerned with knowing. I can say with all confidence I have no idea; maybe a pig farmer in Peru.